Dickens in Lowell is a seven-month, bicentenary celebration of Charles Dickens (1812–1870). From March 30 to October 20, 2012, we’ll celebrate Dickens’s life, his work and his travels in Lowell and America with over 75 performances, speakers, family and community programs. 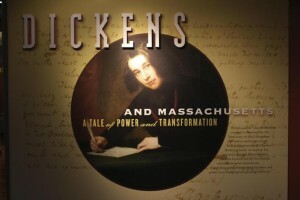 A centerpiece of Dickens in Lowell is a major exhibition, Dickens and Massachusetts: A Tale of Power and Transformation. Come relive Charles Dickens’s two memorable American tours at Dickens in Lowell, a major exhibition and event series in Lowell, Massachusetts, which Boston’s WGBH TV calls “a show and a story as fascinating as Dickens’s own.” Coming up this fall: Performances by Miriam Margolyes and Gerald Dickens, and an original play, Asking for More: Dickens in Nigeria. Best of times! Dickens in Lowell represents a collaboration between UMass Lowell and the Lowell National Historical Park, as well as a host of Lowell’s leading civic and cultural organizations.